The RadGauge offers a design-time support since its creation. The advanced features are accessed through the Smart Tag of the control by clicking on the Configuration Manager link. 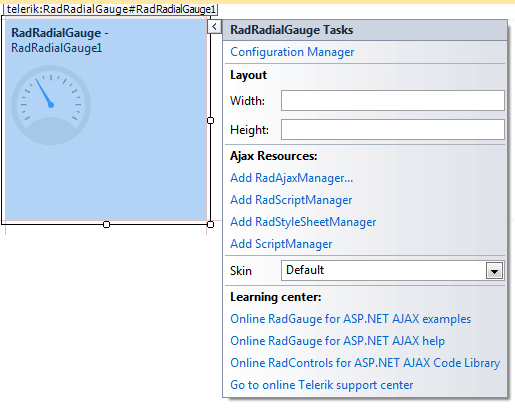 Currently the layout configuration the RadGauge offers is its size. It is an important property when adjusting the real estate on the page and it is available in the root of the Smart Tag just below the configuration manager. The Skin dropdown lists all available skins for the control so you can select one that matches the look and feel of the rest of the page.The skins are displayed via small images to give you a better idea of the color scheme they use. 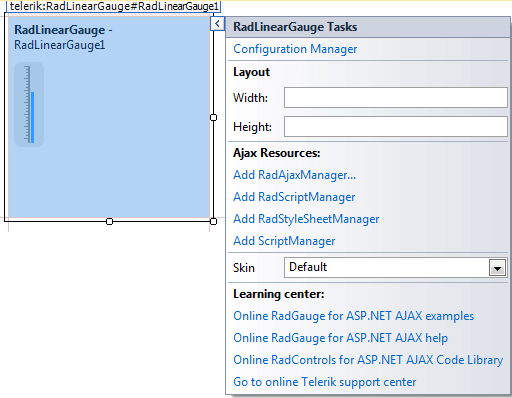 The last section of the Smart Tag provides several links navigate you directly to the RadGauge online examples, help, or code library.